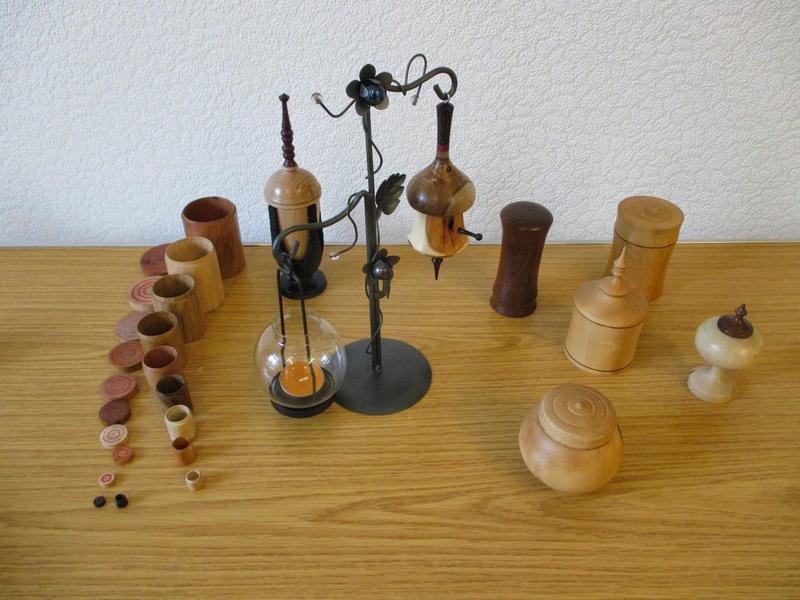 There are few people within the woodturning world that will not instantly recognise the name of world class woodturner and wood artist Rolly Munro from New Zealand. 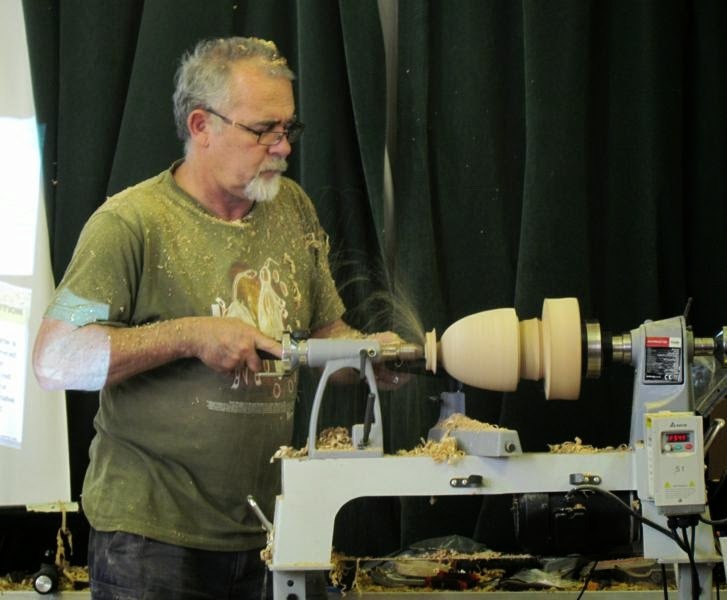 Rolly started woodturning back in the 70's and has since become a maker that transcends woodturning as most of us know it, view Rolly's web site here. 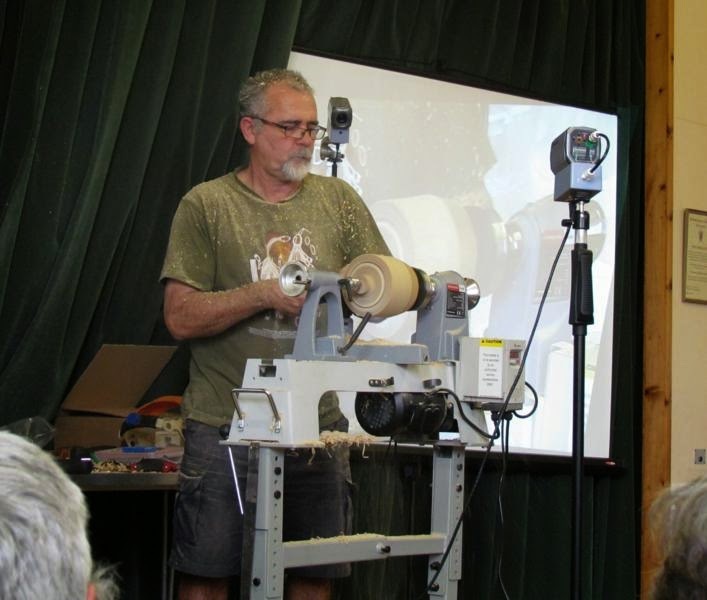 As well as being a creative maker Rolly invented and still personally manufactures the well known and exceptional Rolly Munro Hollowing Tool, as well as demonstrating and teaching all over the world. 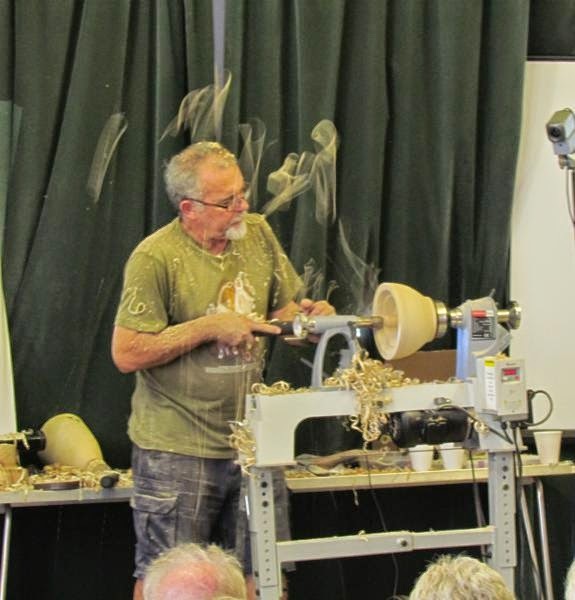 On Saturday the 9th of August Rolly attended an all day demo at Burnham-on-Sea woodturning club after conducting a full days master class at George Foweraker's workshop details of which you can view on this link. 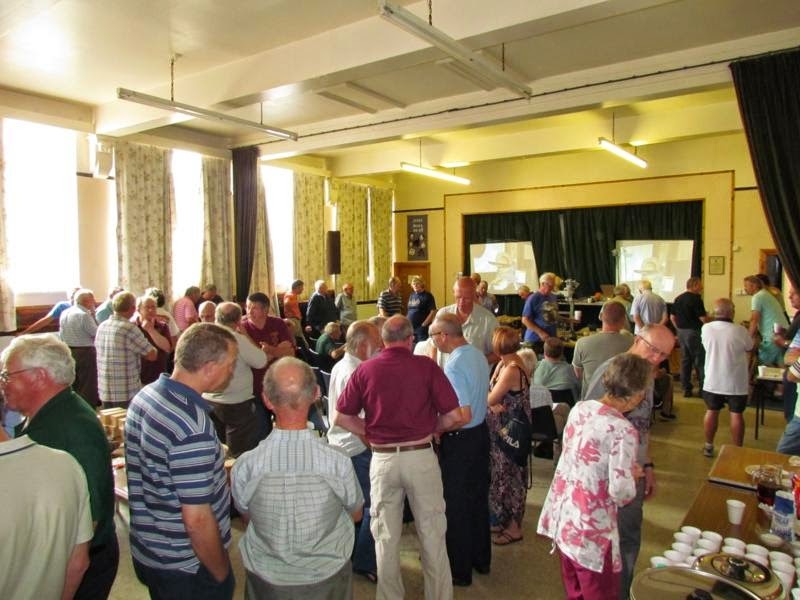 As can be expected the day was well attended with some seventy in the crowd that had turned up for the day. 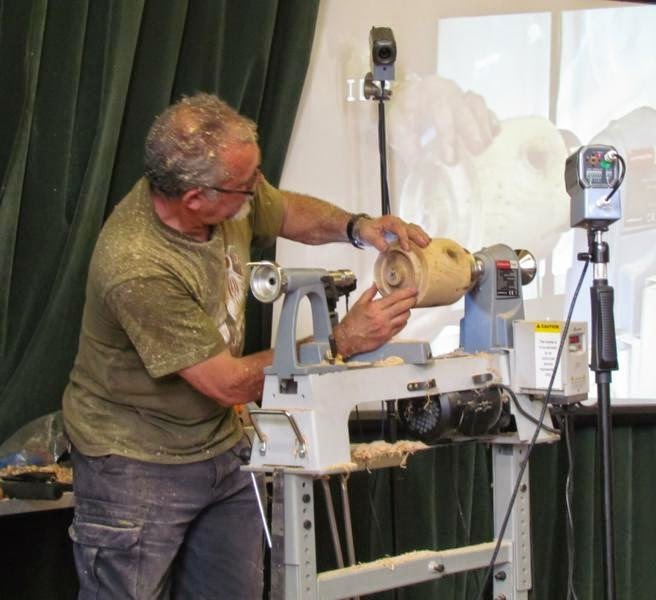 Through out the day there was various product to purchase as well as a raffle, lunch, refreshments and time to personally talk to Rolly about the demo and his tools. People starting to arrive from Cornwall, Devon, Somerset, Dorset and Wales. This was particularly interesting with Rolly being more than open in sharing his ideas, techniques and answering any questions. 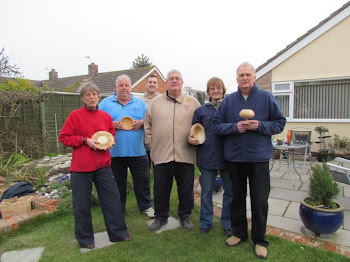 We then took a morning break for refreshments made for us by Sue Foweraker and Sue Meads who looked after us tirelessly all day, thank you to you both. During this time Rolly was happy to answer any questions and to chat to the attendees. 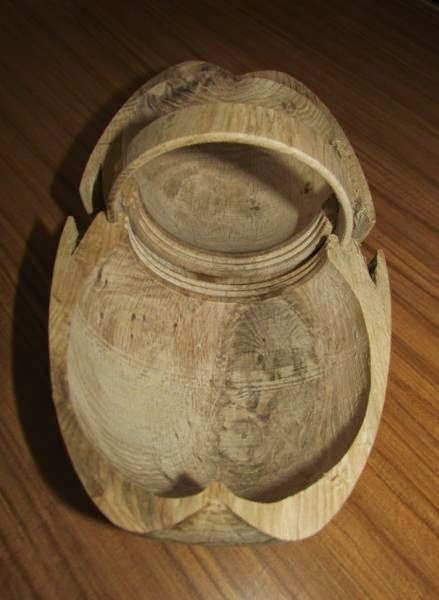 Following the break Rolly made a bowl in cross grain beech using the Rolly Munro hollower with only one other carbide tool for refining of the spigot and to demonstrate cutting angles and bevel support in cutting. 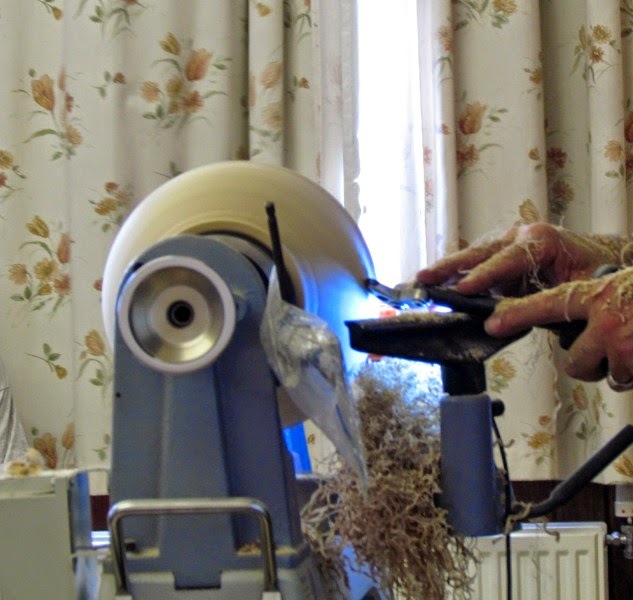 Due to his travels Rolly uses only a few tools and over the years has refined his methods to achieve highly efficient results from the few tools he uses. This was refreshing to see as was the way Rolly clearly and simply explained the use of the tools showing excellent tool control. 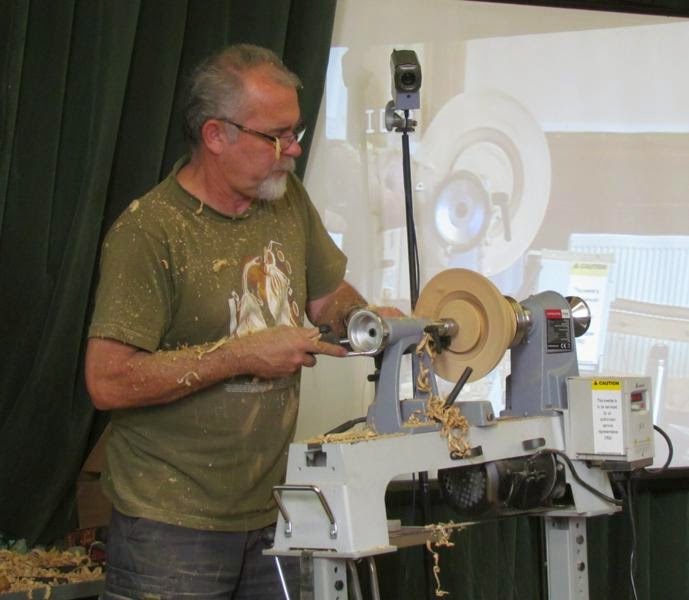 Producing the undercut with the lathe rotating in reverse. 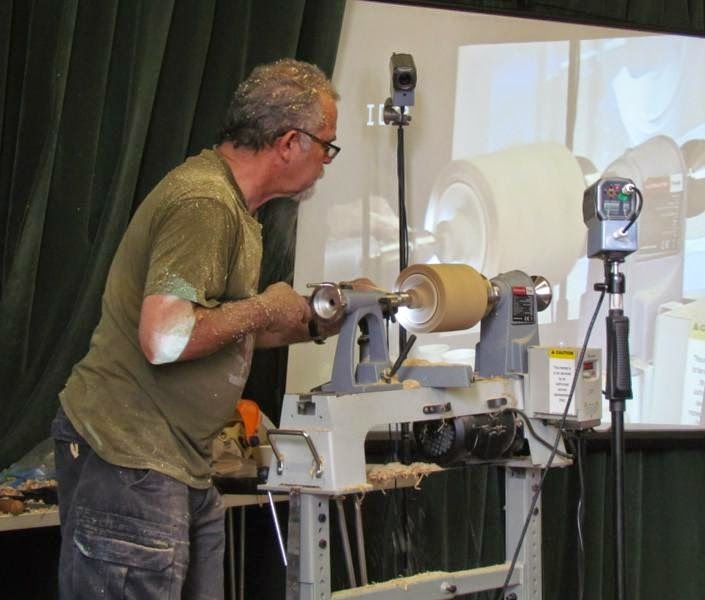 After lunch Rolly started on the main project showing how to produce a hollow form that is cut in half and re-joined using a ring turned from the same piece. 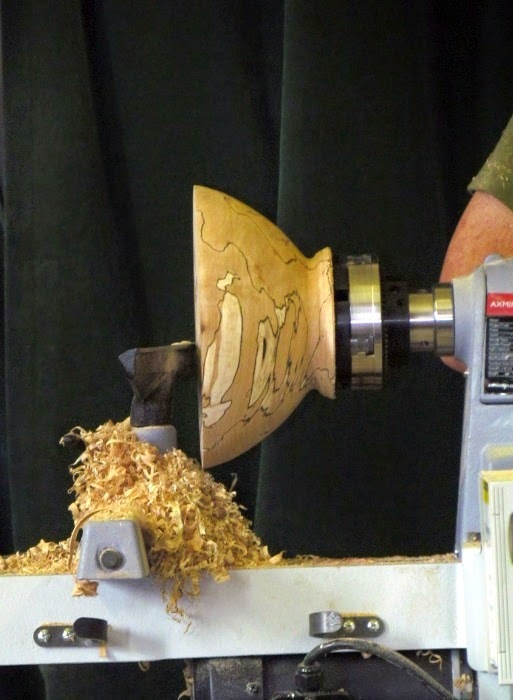 This being a process of turning a sculptural piece from a hollow vessel. Blanked roughed to the round with a ring being turned on the front face. The ring was then parted from the face with a matching recess being cut into the front face to accept the ring later. Waste section and base being refined. 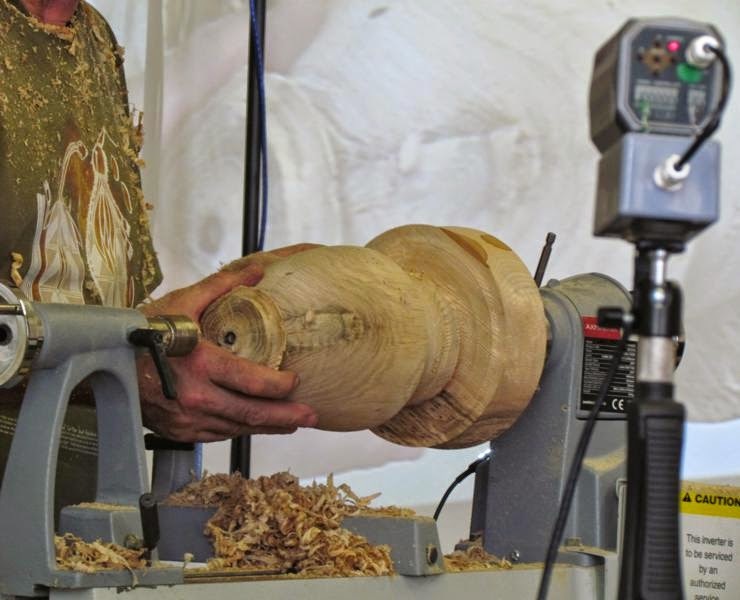 The piece was then cut in half on a band saw and joined with the ring. The piece requiring more work and sculpting. The processes were excellently shown and explained. Then it was time for Rolly to go deeper into using his hollower and to answer any questions and show these specifically in practical terms on a simple bowl. Showing how to achieve various cuts as here with a finishing/refining cut. 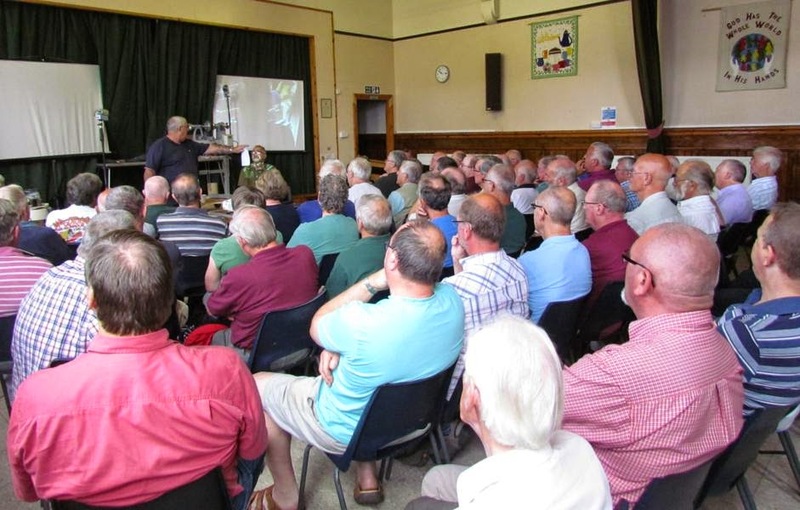 The day was rounded off by a final question and answer session, a cup of tea and Rolly being thanked hugely by us all for an excellent and inspiring demo. 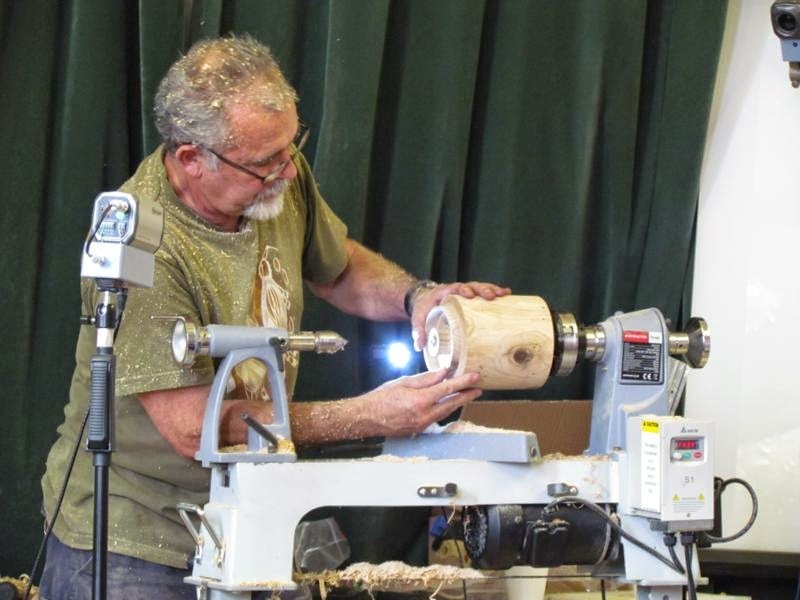 With Rolly then making a trip up to Wales for another demo prior to taking part in the Norwegian woodturning Cruise. 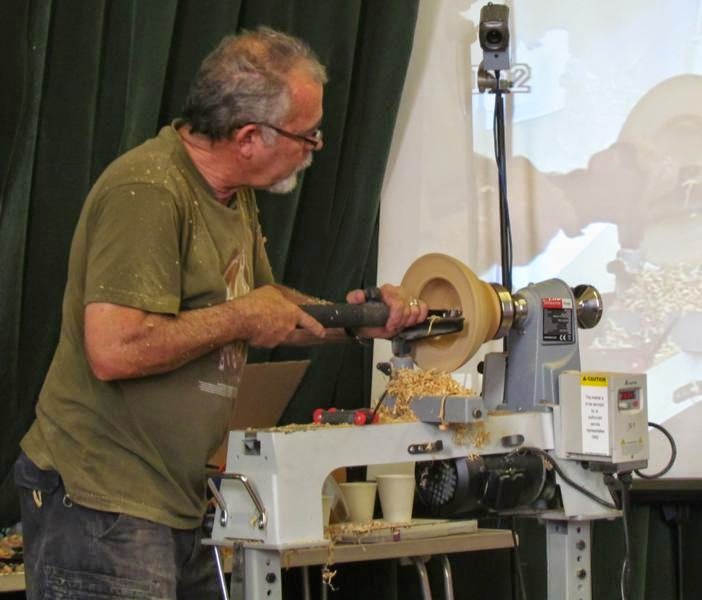 Last night we had a pen turning Demo from Dave Smith from Somerset woodturners. Everybody seemed to enjoy the demo so I expect we will be seeing lots of pens made by members soon. 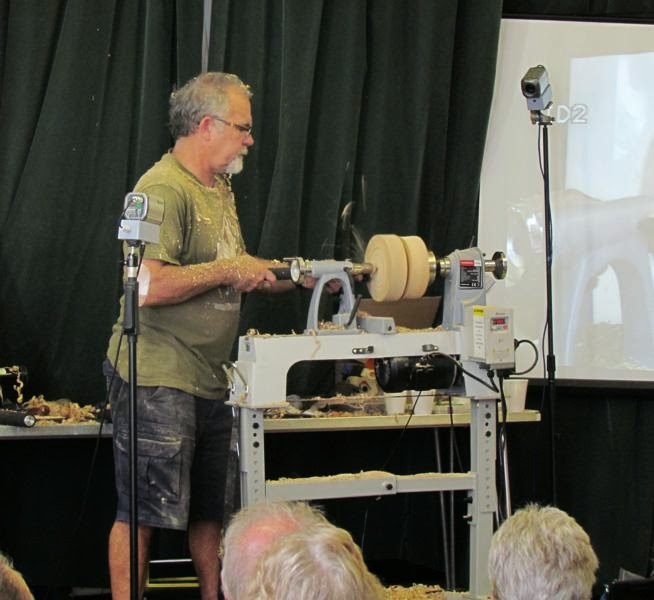 We are all looking forward to the Roly Munro demo on the 9Th of August. With well over a month to go we will have no problem meeting our Goal. 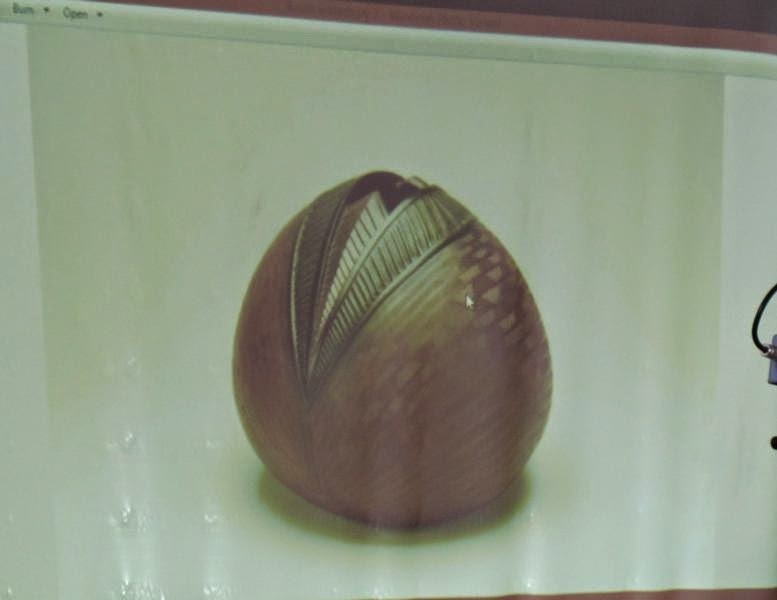 Yesterday we had an evening Demo by Alan Thomas See Alans work here . 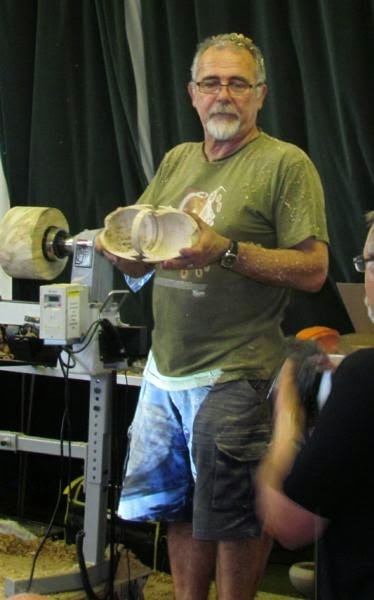 Alan showed us how to create a Hollow form with basic tools by gluing two bowls together. I forgot to take a picture of the finished piece . 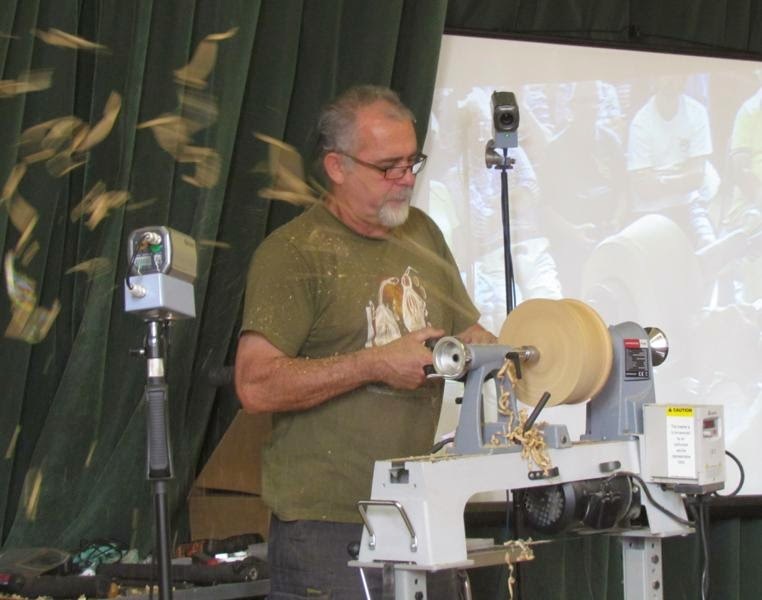 Due to popular demand all of our monthly meetings are now geared to demonstrations. 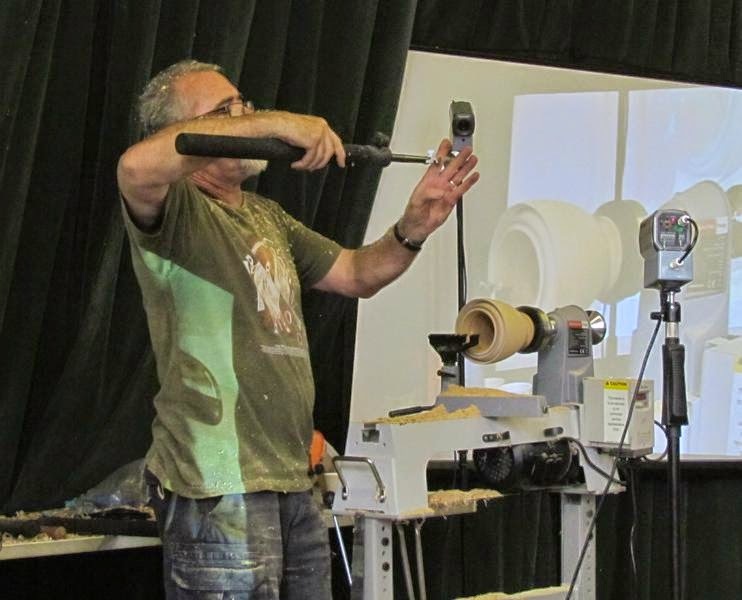 This has always been a bit of a worry for me because when we started the club we intended it to be very much a hands on club but time has proven that this is not what the members want and at the end of the day it is their club They all say the prefer to be shown something that they can go away and practice in their own workshops.To be fair the standard of turning has improved considerably and members are not frightened to bring their work in. 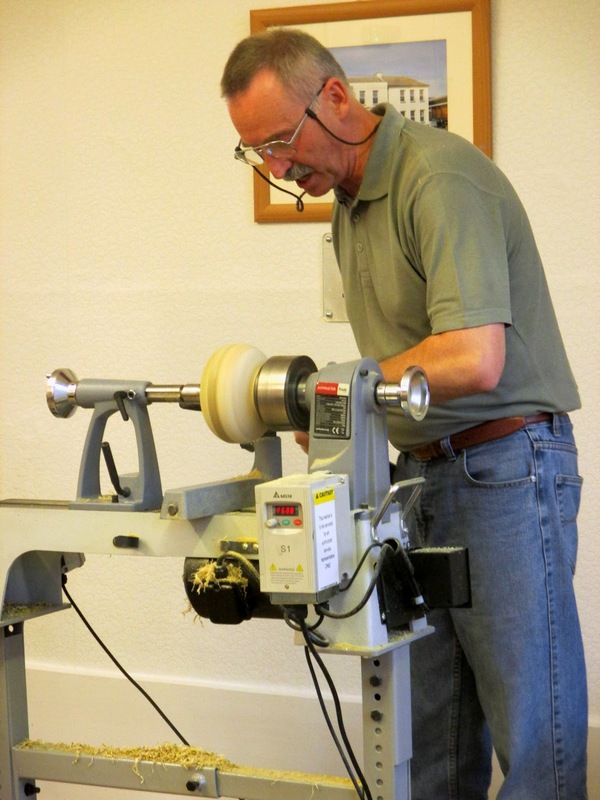 Because we are now geared to demonstrating and have professional demonstrators we have decided to upgrade to a better lathe.It did not seem fair to expect demonstrators to work on a small lathe. 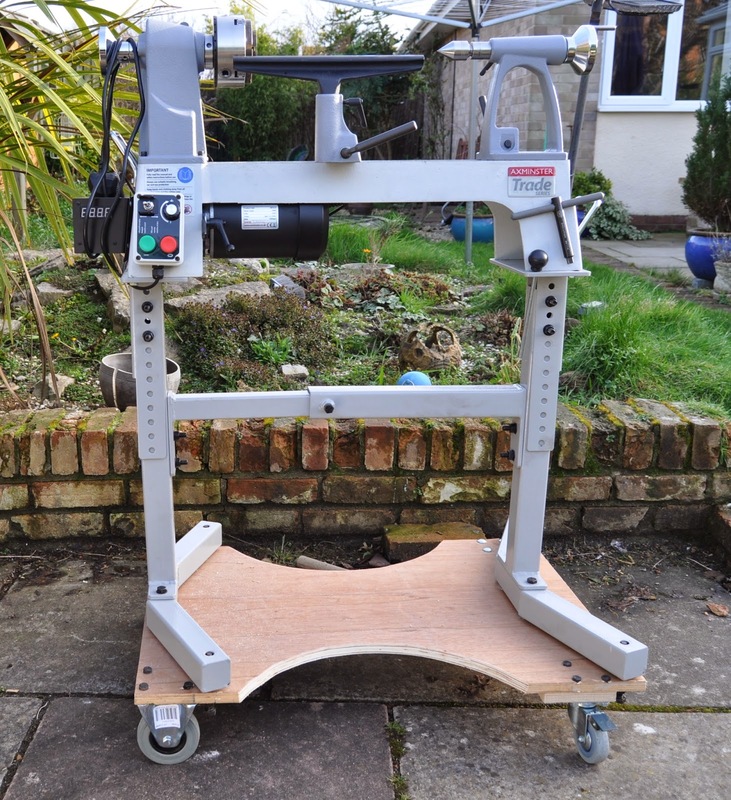 We have upgraded to an Axminster 1416 VS lathe as pictured. 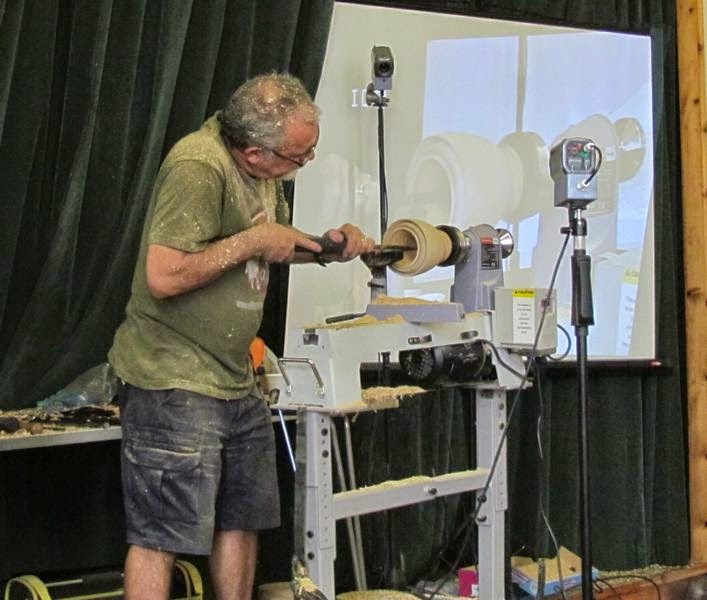 As you can see the lathe is on a platform to enable us to move it easily into the new cupboard we have been allocated it the Burnham on Sea Community Center where we meet. 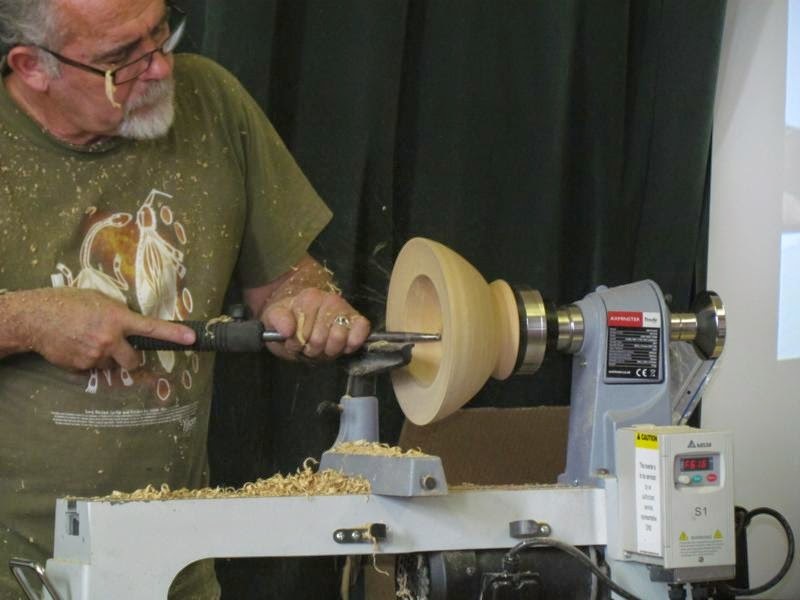 I was A bit concerned that the lathe would not be very stable on the platform but after making a large bowl on it I am amazed how stable it is. 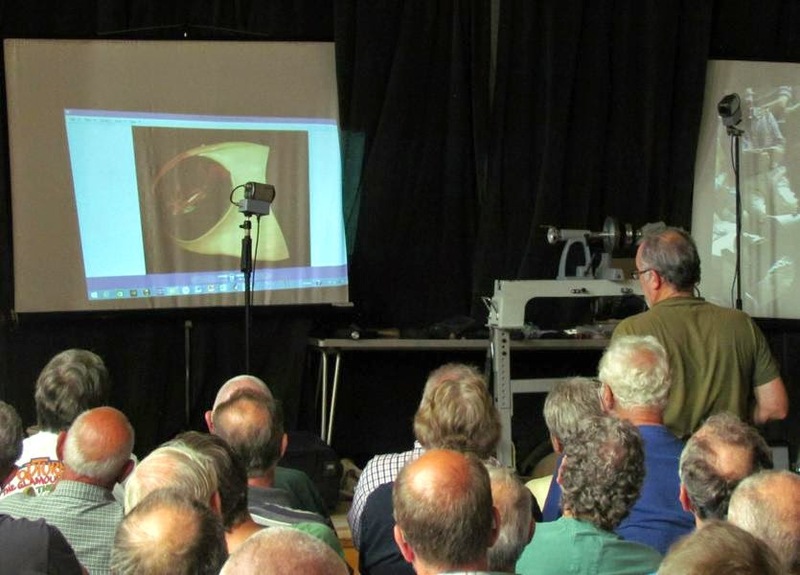 Today Saturday 21st July we had an all day demo by Colin Simpson.This demo day with Colin was arranged many months ago and although I had seen Colin demo on quite a few occasions most of our members had not.We discussed with Colin the sort of demo he would do for us and I told him that most of our members were novice turners.Colin said he would do a demo that would cater for all tastes and all skill levels and that is exactly what he did.Throughout the day Colin's easy relaxed manor went down really well with the members and everything he did was explained in simple language so that everybody could learn form him.Colin worked throughout the day showing many techniques rather than wasting time producing finished pieces.This went down really well and everybody enjoyed it and got really involved by constantly asking questions Every question was answered and Colin is obviously very knowledgeable about his subject.We stopped for lunch and a couple of tea breaks throughout the day and it was a very relaxed and enjoyable atmosphere.My wife Sue prepared all the food the day before and we had a wonderful spread of jacket potatoes chili, salad and much more. This was our first ever all day demo but certainly not our last as it was a great success. Below are some pics from the day. Thank you Colin for a great demo. Thank you Sue for your support and a wonderful spread of food. To enlarge pics left click on pic. First new year meeting of 2012. On Tuesday the 31St of January we had our first meeting of the year.In spite of the bitter cold we had a very good turn out. Being a new year we had a lot to discuss and a lot of things to get through. 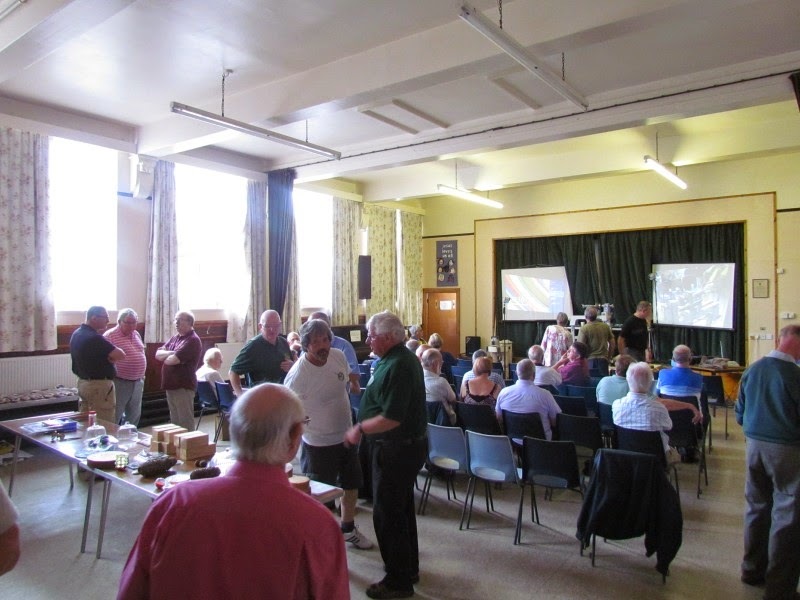 Sue and I made an early start to set up our new Camera and projector system which worked a treat thanks to help from John Brewer who helped me sort thing out earlier in the week.Thanks John. 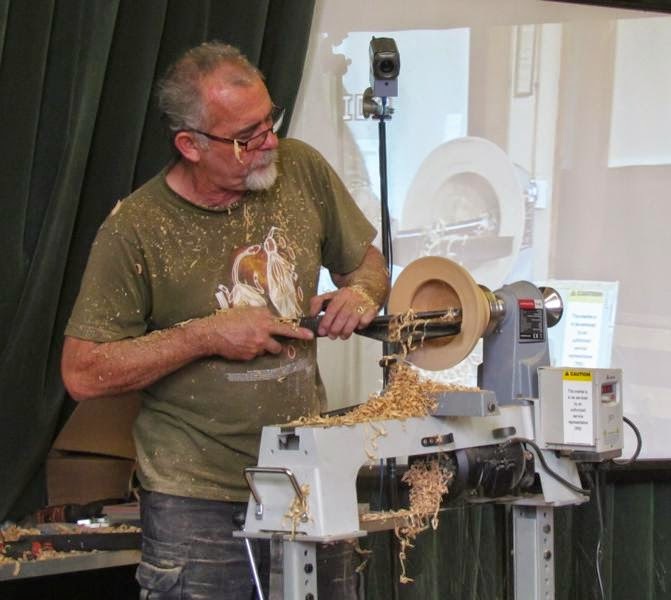 Later in the evening one of our members Colin Stroud showed us how to make a nice box from a piece of Ash .Everybody enjoyed Colin's teaching demo which is good as next month our project to make is a box. We have decided that every other month we will be having hands on and alternate months will be teaching demo's. We will be sorting out a program for the new year soon to include a full day demo from Colin Simpson and later in the year a barbecue. 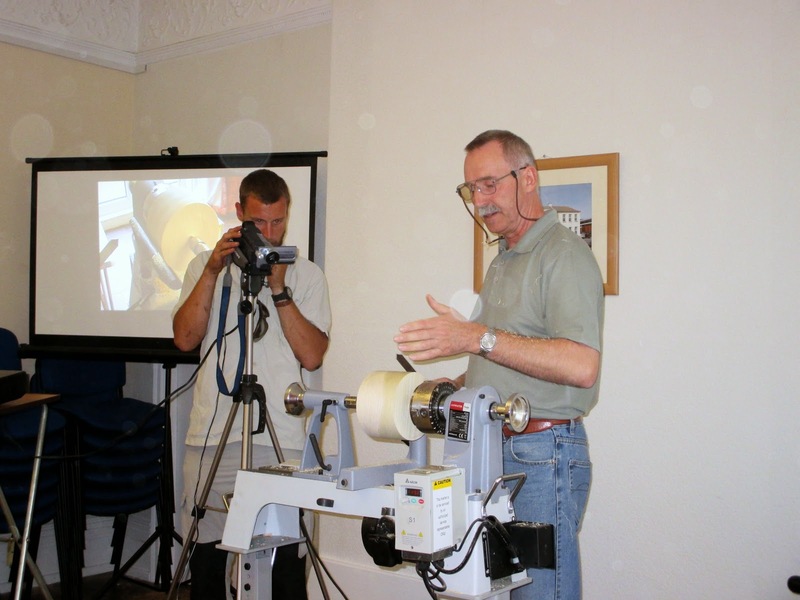 We are going to keep on having our monthly tuition meetings in my workshop as they were very popular last year. Nearly everybody has paid their subs for the new year inc a couple of new members. Items for sale or exchange.